In the intervening time, that vision has mostly come to fruition…for VIM users. For the rest of us, it’s more like information at the end of your mouse clicks. But close enough. 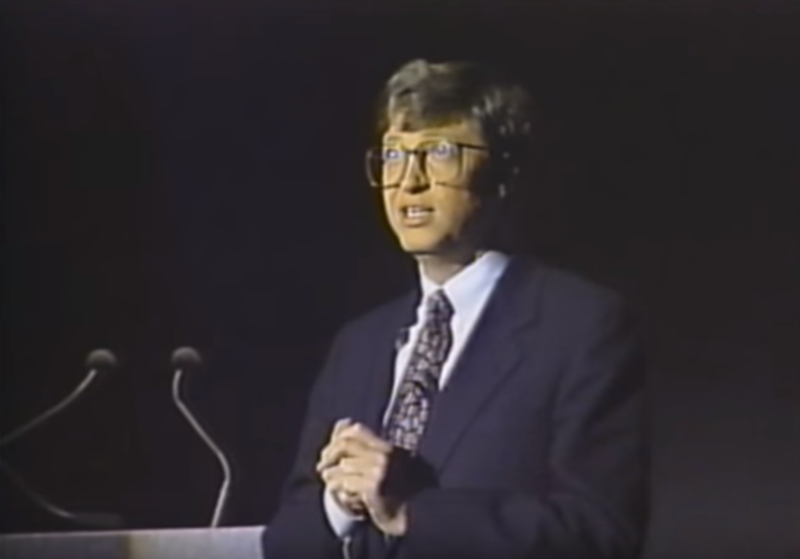 Visual Studio is a salient embodiment of this vision. It contains a rich set of features along with a third-party extension ecosystem such that nearly every task a developer needs to accomplish can be done in the IDE. Tools like IntelliSense provide helpful context while coding. This creates an environment where developers who use Visual Studio love to stay in Visual Studio. So much so that their friends start to worry about them, like that friend who just went through a rough break up and hasn’t left their apartment in weeks. I say that out of love as one who has spent many fond hours churning out code assisted by the helpful embrace of IntelliSense. 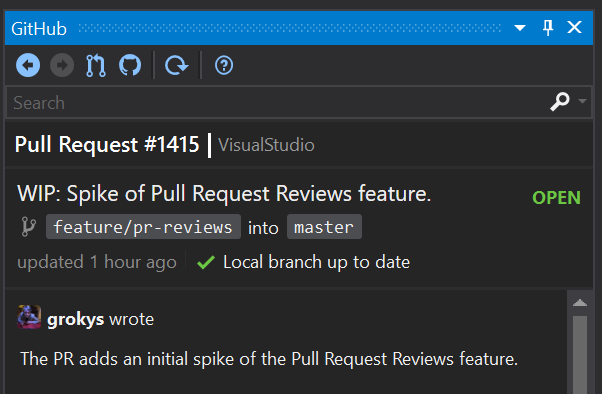 This week, the Editor Tools team at GitHub (the team who brought you the GitHub Extension for Visual Studio) released a new version that contributes to this vision by bringing Pull Requests closer to your fingertips! Besides rebasing and merge conflicts, submodules may be one of those features that cause the most angst in Git. This feature seeks to reduce that angst. When switching to a PR branch, it brings any submodule changes to the developer’s attention. There’s even a handy little button to update them for you! Previously, there was no indication that submodules had changed apart from random build failures and checking Git status on the command line. From there, you would have to sync and update submodules from the command line. This unnecessarily forced developers outside of Visual Studio when doing a GitHub related action (opening a PR). With this release, you can see which PR you are on directly from the status bar, and navigate to its details by clicking the PR number! Finally, this update enables developers to quickly switch from a diff view back into the editor. A special thanks to Jamie Cansdale (you may know him from such hits as TestDriven.net) for working on these three main features and getting them out to you! And to the rest of the Editor Tools team for making this release possible. It takes a village! Be sure to follow them on Twitter! And in case you haven’t paid close attention last year, here are some cool features we shipped in 2017. I gotta admit, I was halfway through this blog post before I realized you were talking about Pull Requests not Public Relations.. This looks cool and I'll probably use it on my personal GitHub repos. 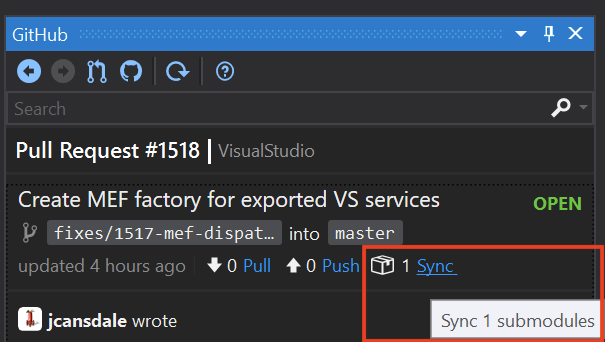 At work we use VSTS for source control, would be great if these features worked with VSTS too. I have no idea how the GitHub VS extension works and I get confused when I'm looking in VS's Team Explorer if what I'm seeing is the native VS git extension (is there one?) or if I'm seeing the GitHub team's VS extension. Yeah, it's a bit confusing. 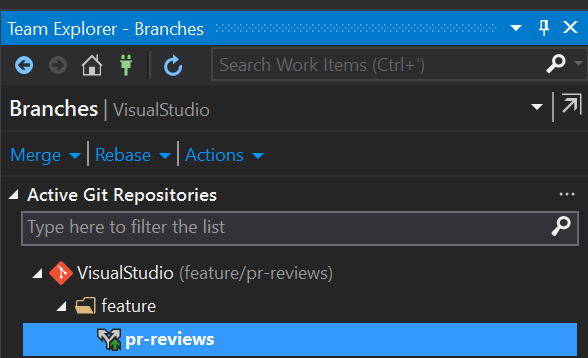 The normal Git functionality is all built-in to Visual Studio. GitHub just adds the GitHub specific components like authentication, Clone repos, inline comments, etc. Is there a command for the switching between diff and regular view ("Enter")? As a VsVim user, I probably need to bind it.